In every negotiation with a deadline, one of the negotiating parties has to accept an offer to avoid a break off. A break off is usually an undesirable outcome for both parties, therefore it is important that a negotiator employs a proficient mechanism to decide under which conditions to accept. When designing such conditions one is faced with the acceptance dilemma: accepting the current offermay be suboptimal, as better offers may still be presented. On the other hand, accepting too late may prevent an agreement from being reached, resulting in a break off with no gain for either party. 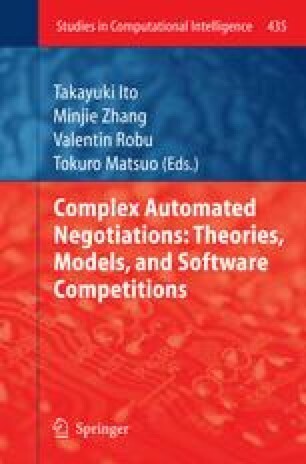 Motivated by the challenges of bilateral negotiations between automated agents and by the results and insights of the automated negotiating agents competition (ANAC), we classify and compare state-of-the-art generic acceptance conditions.We focus on decoupled acceptance conditions, i.e. conditions that do not depend on the bidding strategy that is used.We performed extensive experiments to compare the performance of acceptance conditions in combination with a broad range of bidding strategies and negotiation domains. Furthermore we propose new acceptance conditions and we demonstrate that they outperform the other conditions that we study. In particular, it is shown that they outperform the standard acceptance condition of comparing the current offer with the offer the agent is ready to send out. We also provide insight in to why some conditions work better than others and investigate correlations between the properties of the negotiation environment and the efficacy of acceptance conditions.